Development of multicellular organisms is dictated by cell-cell interactions mediated by conserved signaling pathways. A key challenge encountered by these pathways is to generate reproducible patterns, despite fluctuations in the doses of the signaling components, which commonly occur due to genetic and environmental alterations. To identify and characterize the mechanisms underlying such developmental robustness, we are combining experimental and theoretical computational approaches, in collaboration with the lab of Naama Barkai. We employ a systems-level approach to a restricted signaling module, where we assume that all the components within the module are known. The challenge is to obtain a quantitative understanding of the design principles of the module, in a situation where most of the quantitative in vivo parameters (e.g. concentration, affinity, diffusion rates) are not known. The initial steps of patterning the Drosophila embryo along the dorso-ventral axis utilize a crude asymmetry generated during oogenesis, and a signaling pathway whose transcripts were provided maternally. We have recently demonstrated how this signaling pathway is able to generate a sharp, ventrally biased gradient (Haskel-Ittah et al., Cell 2012). The key to the formation of this gradient is the multifaceted nature of the Spatzle ligand, where the pro-domain (N-Spz) and active region (C-Spz) can exist in three different conformations. This allows shuttling of the active ligand towards the ventral midline, and maintains a gradient that is sharp and robust. We have now turned to analyze the biological variability in this system, and the mechanisms that are employed to correct it. We identified a mechanism that is normally used to correct variability, and can directly monitor the noise arising in its absence. 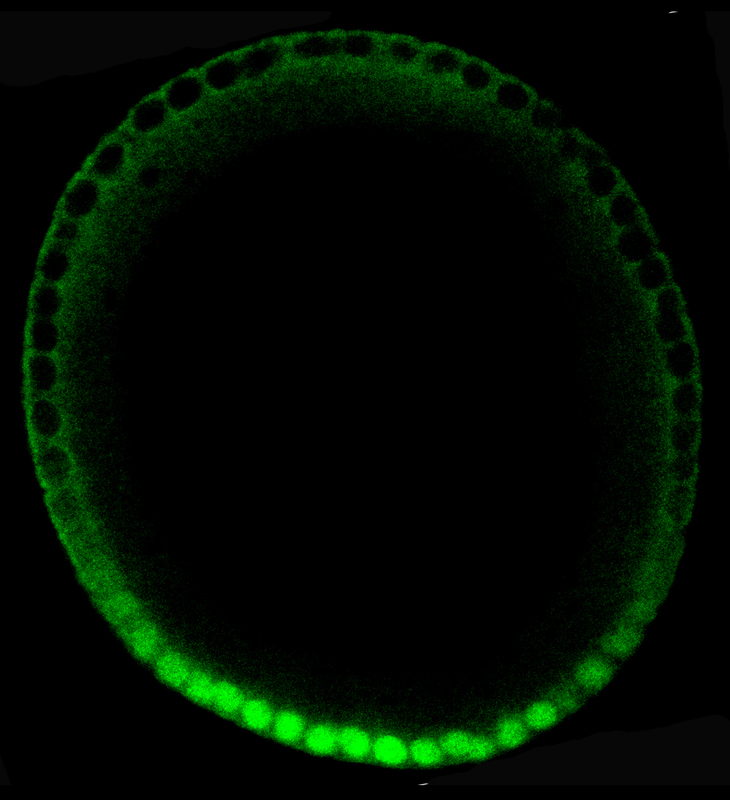 Ventrally biased nuclear-localization gradient of the Dorsal transcription factor.